Welcome to the world of renowned Kukri knives from Nepal! Ever heard about the brave legends of the Gurkha tribe of Nepal and India! Well, they are all incomplete without the mention of their magnificent Kukri knife! 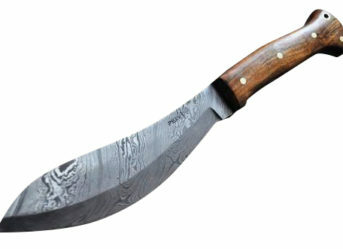 The Kukri is a long blade, like the machete and has various uses, but primarily used as a war weapon. 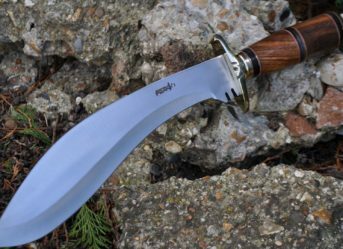 Kukri is the characteristic of the Nepalese Army, the Royal Gurkha Rifles of the British Army, the Assam Rifles, the Assam Regiment , The Gorkha Rifles and the The Gorkha Regiment of the Indian Army. It really has a glorious past and is still one of the core features of the Nepalese culture and the adjoining areas. 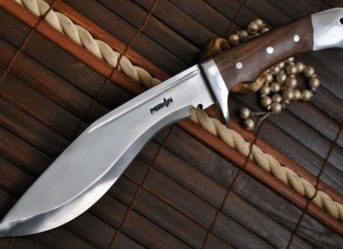 The Kukri is a Nepalese knife which can be found in every household of the country and also in the north eastern states of India. It is like a machete, long, approximately 16 to 18 inches in length and around 450 to 900 grams in weight. The major difference between both of them is that the blade in a khukri is that it has a forward-curved blade instead of a straight blade, has a single cutting edge and a notch close to the handle. The notch comes in handy as the khukri is a war weapon so it does not let the blood drip to the user’s hand and make them slippery. Kukri Knives is a legendary war weapon! Although it is used for many other tasks and is present in almost Nepalese or Assamese household, it is still considered a war weapon and has a glorious history attached to it. Along with the military use of the Gurkha Blade, the Kukri is also used clearing, chopping firewood, building, cutting meat and vegetables. They are also a part of many traditions in the nepalese culture. The kukri is a versatile knife. It can be used as smaller knife as well as a shovel or an axe. You can easily buy a kukri knife for sale in UK if you are interested in having this fantastic blade in your collection.